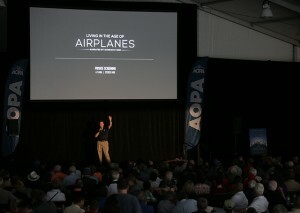 If you’ve been to an AOPA Fly-In, you know what these fun grassroots gatherings are all about. If you haven’t, you’re in for a real treat. New fly-in destinations. Hundreds of aircraft, old and new. Aerobatics from some of the best in the business. Dozens of exhibitors featuring their latest cockpit boxes and technologies. And speakers that make you laugh and think. Can you think of a better way to spend a Saturday than with family, friends, great food and all things GA? Neither can we! So fly, drive, thumb, ride your bike – whatever you have to do to get there, get there. Meet old friends, make new ones, and rediscover what makes aviation and its people so special.